This story starts, like so many paperback thrillers, with a death shrouded in mystery. But not just any death — this was the death of the most powerful man in the world at the time. I should really write mystery novels. The Roman Empire. It was big. The man in question was Publius Aelius Hadrianus Augustus, or Hadrian, and as Emperor of Rome at the height of its power he ruled a vast swath of territory spanning from England to Egypt. An admirer of the Greeks and a humanist, he is remembered today for being one of the “good emperors,” and of course for building his eponymous wall in Britain. By all accounts, his 20-year rule was marked by prosperity. He managed to visit almost every province of his empire, a true feat given the fact that it was, well, the second century. But shortly after his 60th birthday, Hardian fell ill. We know the details of his illness thanks to Cassius Dio, a historian writing some 60 years after the fact. Hadrian had been long-plagued by nosebleeds, but this minor annoyance started to become more severe. Soon — and I’m quoting Cassius here — “he became consumptive as a result of his great loss of blood, and this led to dropsy,” dropsy being an old fashioned word for edema, or swelling. He tried “charms and magic rites” that would relieve the edema temporarily, but inevitably he would fill up again with water. Hadrian became depressed and “longed for death”. Epistaxis (fancy word for nosebleeds) and edema aren’t a whole lot of information to work off of, but that hasn’t stopped paleopathologists from trying to diagnose Hadrian ex post facto. And I just want to say that I’m jazzed that a paleopathologist is a real job. He has been diagnosed as alternatively having kidney failure, heart failure, or my favorite diagnosis, Osler-Weber-Rendu syndrome, also known as (since that one’s a mouthful) heriditary hemorrhagic telangiectasia, a rare genetic disorder of abnormal blood vessel proliferation that leads to heavy nosebleeds, and generally body-bleeds. Its victims usually get a high output heart failure from mixing aterial and venous blood flor. They say that history makes the diagnosis 80% of the time, but that doesn’t take second-hand accounts from two thousand years ago. Fortunately, more recently an American physician, Dr. Petrakis added a bit of physical exam to Emperor Hadrian’s cold case. 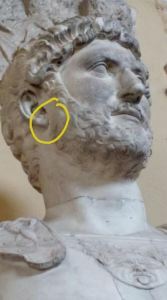 Dr. Petrakis was observing a bust of Hadrian at the Athens National Museum and by chance saw a prominent physical exam finding. He excitedly sought out three additional busts of Hadrian in Greece and Italy, which all exhibited the same sign. And this physical sign led him to his diagnosis. What Dr. Petrakis saw was bilateral diagonal earlobe creases, otherwise known as Frank’s sign. To imagine what this looks like, take the lower lobe of your ear and gently roll it between your thumb and your forefinger. If you have a Frank’s sign, there will be a deep crease in the middle. This crease was first noted by Dr. Frank in 1973 in a group of 20 patients who were young and had angina, the chest pain you get when your heart doesn’t get enough blood. Since then, over 50 studies have been published on the diagonal earlobe crease. Together, they suggest that Frank’s sign is an independent predictor of heart disease. That is, if you have this earlobe crease, you’re more likely to have heart disease regardless of other risk factors such as cholesterol, blood pressure or smoking. Of course, science being science, other studies have found that there is no predictive relationship – that Frank’s sign might in fact just be a sign of normal aging, and older people are more likely to have heart disease. So how useful is Frank’s sign to clinicians? A 2011 meta-analysis looked at all studies evaluating the earlobe crease as a predictor of coronary artery disease, and found that it was statistically significant. Just how significant it is will take a brief foray into biostatistics, specifically likelihood ratios. And long-time listeners of my podcast should know just how much I love biostatistics. 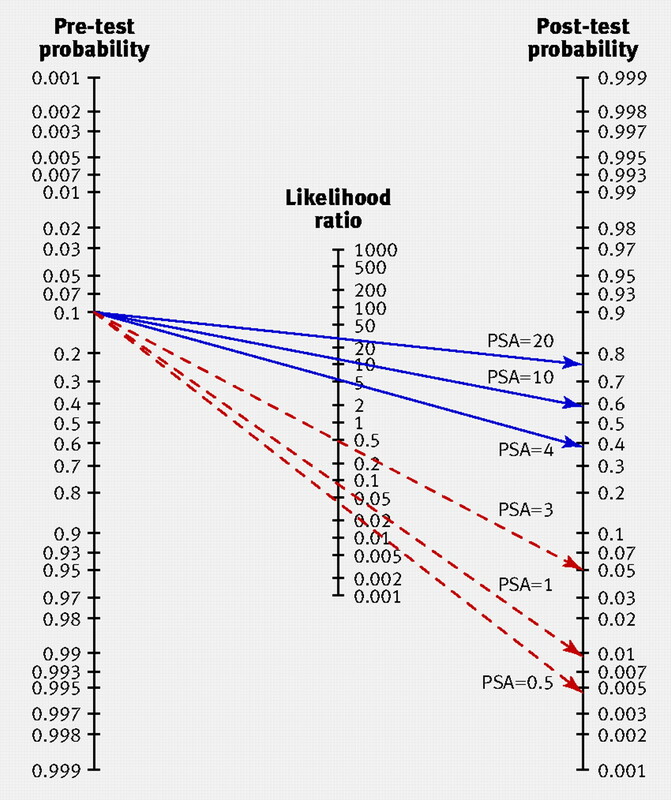 For biostatistics geeks, a likelihood ratio is the sensitivity divided by 1 – specificity, or in normal people language the probability of finding a clinical sign in patients with a disease divided by the probability of the same finding in patients without a disease. This is easier to understand with a very made-up example. Let’s say that 80% of people with liver disease had jaundice, or yellow skin, but only 10% of people without liver disease have jaundice — the likelihood ratio would be 8. LRs greater than one argue for the diagnosis — liver disease, in this example. LRs less than 1 argue against it. If the LR is one, you might as well flip a coin because that test tells you nothing. This is all important because we can combine the likelihood ratio with the pre-test probability of a disease to find out how much more like a physical finding makes it that someone actually has the disease. In reality, I never actually run these calculations, but instead use a table that correlates LR with the change in probability. It’s called Fagan’s nomogram, and it is awesome. Don’t leave home without it. In the case of the diagonal earlobe crease, the meta-analysis found that the likelihood ratio was 2.37, or roughly 17% more likely to have coronary artery disease. In other words, let’s say the middle aged man in my clinic has a 40% chance of having coronary artery disease, which I can determine from any number of risk calculators. If, when I examine him, I notice Frank’s sign, I can presume that his chance of having CAD has increased to ~60%. Is this enough to change my management? Probably not. Quite frankly, a LR of 2.4 is nothing to get excited over, entering into the “meh” range for most physicians. But then again, the likelihood ratio for predicting heart attacks from traditional risk factors such as smoking, high blood pressure, and high cholesterol, was only 1.07 – barely better than a coin flip. So that takes us back to the poor Emperor Hadrian. If I were making a summary statement (which is the heuristic physicians use to put a story together), I’d say something like, we have a 60 year-old history with a history of chronic nose bleeds, now presenting with worsened nose bleeds and progressive edema; physical exam was notable for Frank’s sign. His volume overload suggests either heart, liver, or kidney failure, and sure, the nosebleeds might lead to the zebra of Osler-Weber-Rendu syndrome, with it’s high-output heart failure. But that extra 17% chance of having Frank’s sign on physical exam — including when he was a much younger man– push the diagnosis towards heart disease as Hadrian’s killer. Slam dunk it is not, but if I could be the personal physician to the Emperor, it would be enough for me to start him a good cardiac package. Well, that’s it for the episode. This might seem a little lazy of me, re-recording my first episode instead of creating new content. But I have two main reasons. So first of all, I just got back from an absolutely wonderful road trip across southern Italy, and like Dr. Petrakis, I had the pleasure of getting to see Emperor Hadrian first-hand (you can see the picture on my website). In the beginnings of the Vatican museum, hidden down a hallway where relatively few tourists venture, are shelf after shelf of heads — busts from antiquity,. They’re barely labeled, with old paper labels from the 60s only in Italian. But I grabbed my wife and went searching, and I finally found him — labeled Adriano, on the top shelf, above my head. With, of course, his Frank’s sign. And I can imagine how excited Dr. Petrakis must have felt when he saw Hadrian for the first time. Top shelf Hadrian. Yellow circle was not included. The second reason is that I have a lot more listeners than when I first started (when it was my parents and a few doctor-friends), and I’ve learned a lot more about audio-editing since then. Since episode one seems to be a popular jumping off point for a podcast, I figured I might as well use it as an excuse to play around with my new microphone and audacity a little bit. So thanks for listening, even if it is for the second time! Please, rate me on iTunes and/or Stitcher, or however you get your podcasts. The website is www.bedside-rounds.org. And please talk to me! I’ve doing my best to talk to listeners on Twitter and Facebook. I tweet @AdamRodmanMD, and you can find me on facebook at BedsideRounds, one word. Petrakis NL, Diagonal Earlobe Creases, Type A Behavior and the Death of Emperor Hadrian. West J Med. Jan 1980; 132(1): 87–91.